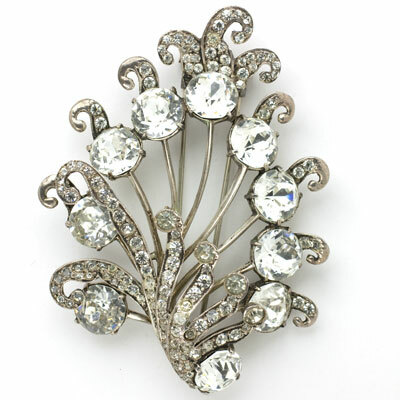 This collection of vintage dress clips includes singles and pairs in 1930s Art Deco designs as well as big and bold jewels in the Retro Modern style of the 1940s. First introduced in the early 1930s in fine jewelry, costume jewelry makers joined the bandwagon of this incredibly popular accessory. 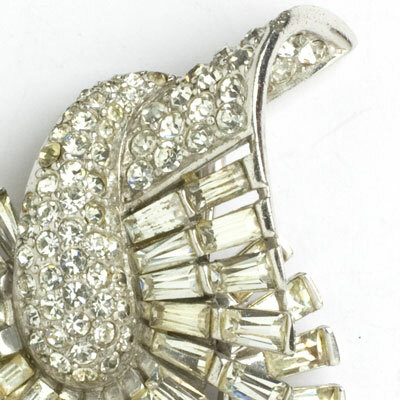 Women wore one clip at the bottom of a V-neckline as well as on a hat, belt, or purse. 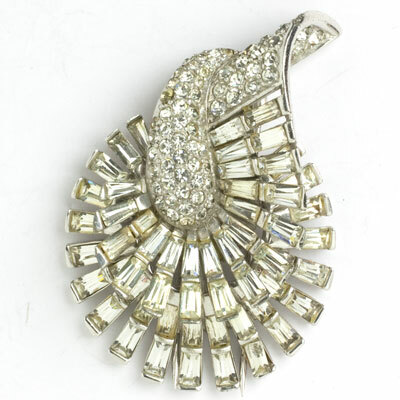 In pairs, dress clips perfectly anchored the edges of the square neckline that was prominent in the era. 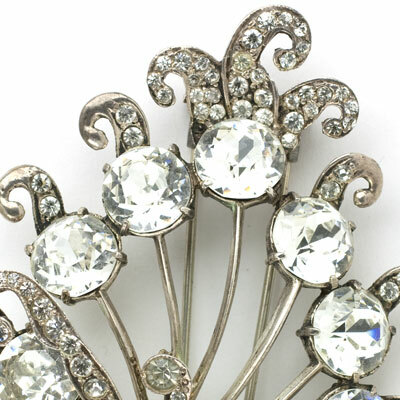 By the 1940s, women were wearing furs around their shoulders, and jewelry makers obliged with the double-prong clip backs needed to hold the furs in place. 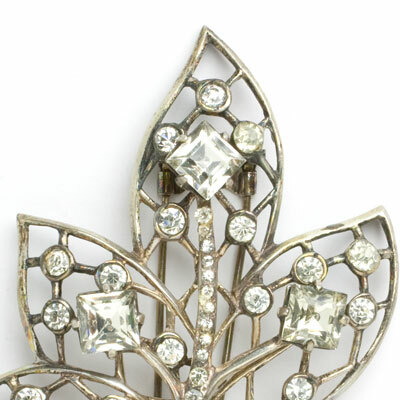 See also Double Clip Brooches. 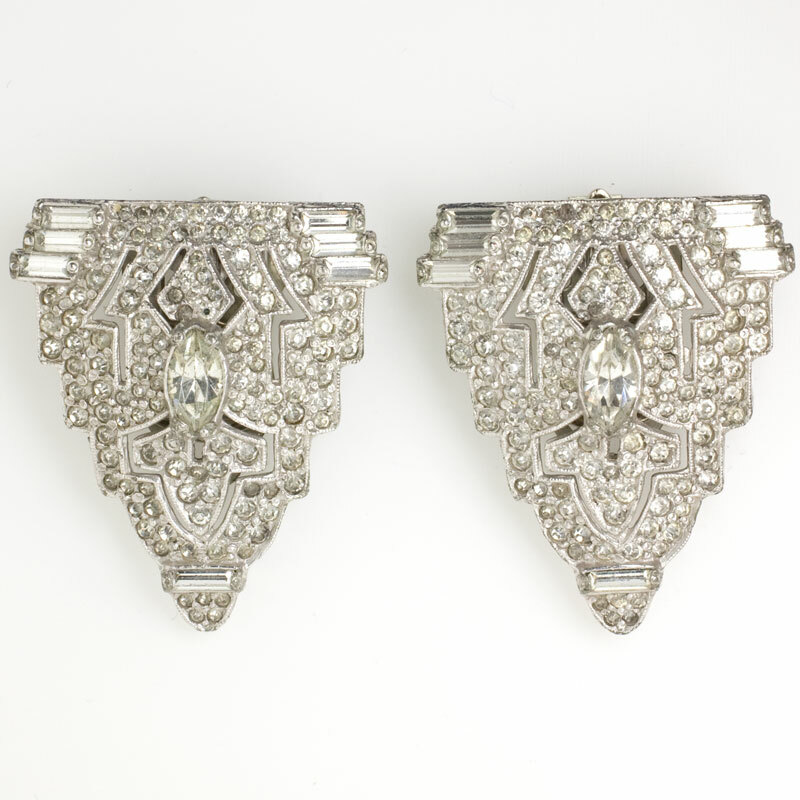 This pair of triangular-shaped Art Deco dress clips is beautifully embellished with baguettes, round diamanté, and a center marquis-shaped stone, all set in rhodium-plated base metal. The cut-outs enhance the intricate design. 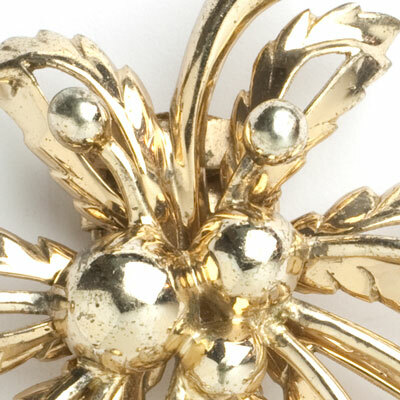 In addition to wearing one or both clips as intended, you can also wear one as a pendant. The last photo shows it on a sterling chain, so you can see the elegant look this combination creates. (The chain is not included.) Although these clips are marked with a utility patent number, it is unreadable. Quite a mystery! Scroll down to see a selection of coordinating bracelets. 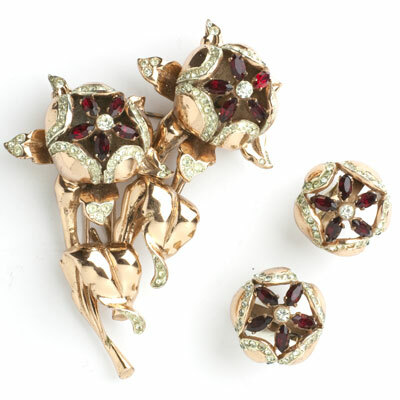 Or complete your look with your faux or real diamond stud earrings. 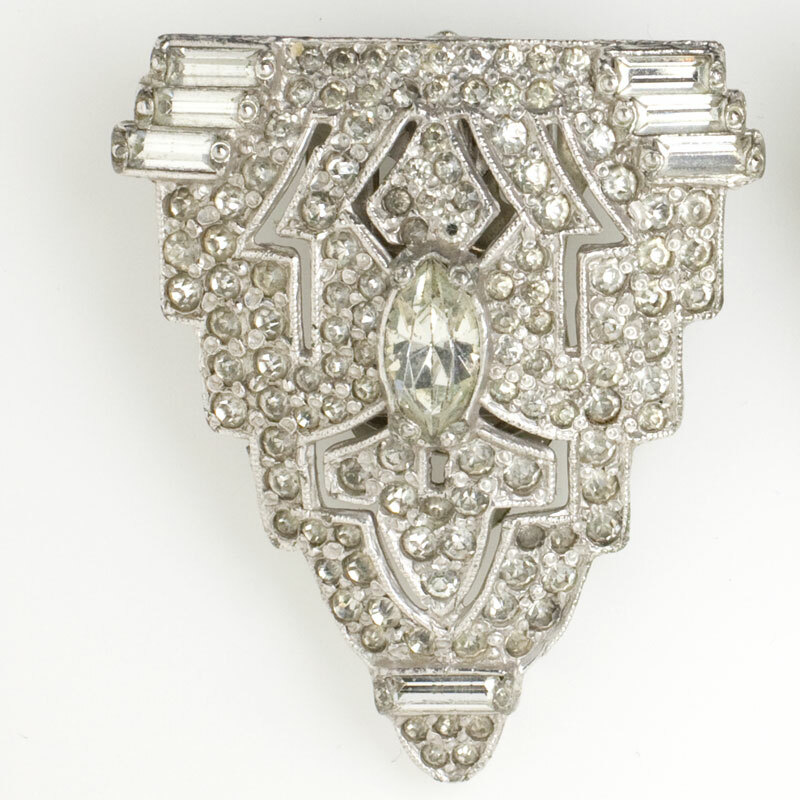 This luscious 1940s dress clip features baguettes and pavé set in rhodium-plated metal. Even the underside of the furled upper corner is bejeweled. Marcel Boucher was one of the finest designers in this era, and this piece attests to his talent. Wear it to great effect on a weighty fabric, such as a coat or jacket. 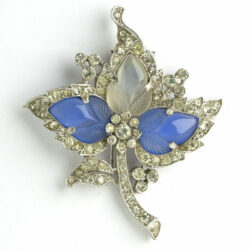 Or wear it as a bold pendant on a substantial chain. 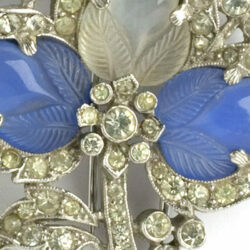 The third photo shows this clip on a sterling flexible choker from the same decade – scroll down to see it. Note that the stones do not have the yellow tinge suggested by the photos. 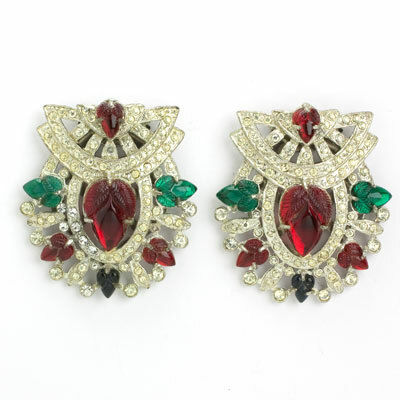 Ruby, sapphire, and emerald acorn-shaped glass stones are surrounded by diamanté in this classic pair of 1930s dress clips. 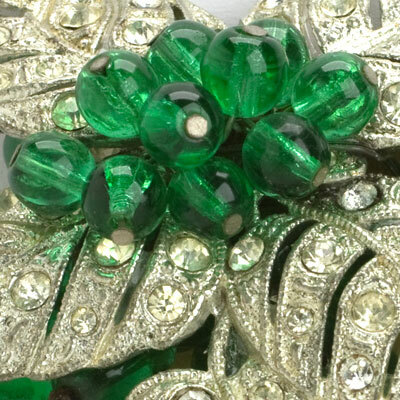 Costume jewelry makers adopted this practice of molding colored glass in the shapes of leaves or fruits to imitate Indian-carved gemstones used in fine jewelry. 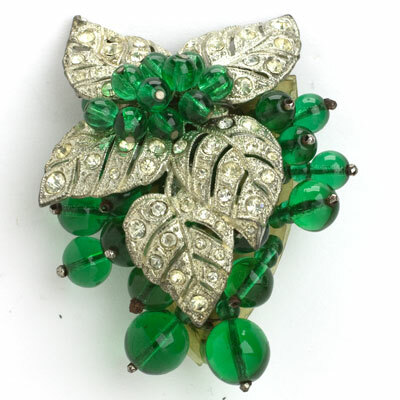 Firms such as Cartier and Van Cleef & Arpels popularized these fruit salads or tutti frutti in Art Deco pieces. 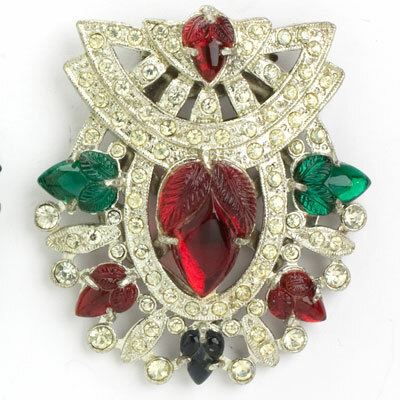 The trio of rubies, sapphires, and emeralds was a favorite combination. 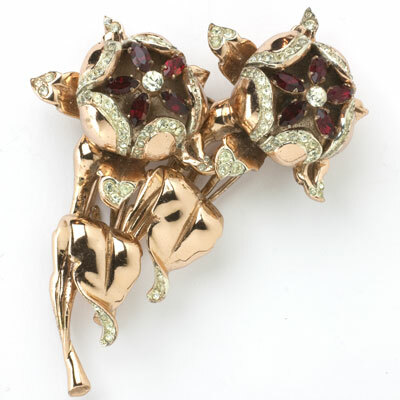 The setting of this pair is rhodium-plated base metal. Notice the photo showing one clip worn as a pendant on a sterling silver chain (which is not included), to illustrate the versatility of this type of jewel. You probably have a silver or white-gold necklace that would work as well. The utility patent for the dress clip mechanism is here, shown below the name of Anthony E. Waller. A layer of berries is attached to openwork leaves in this substantial piece by Nettie Rosenstein. 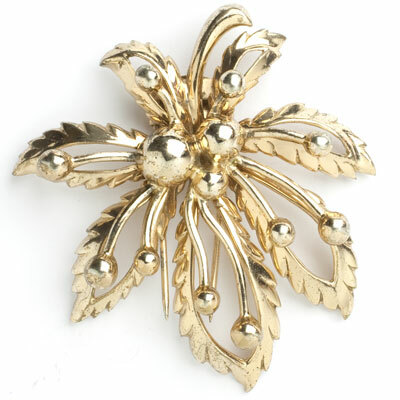 Made of gold-plated sterling silver in the 1940s, this dress clip has a hinged, double-prong back. 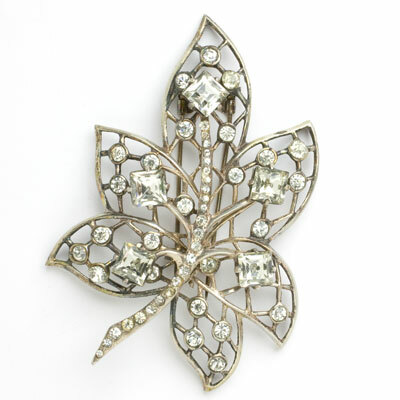 This decorative, high-quality piece looks great on the shoulder or lapel of a dress, jacket, or coat – the fabric just needs to be weightier to support the jewel. No wonder this maker's jewelry is highly-prized!